In The Yellow Wallpaper, a short novel written by Charlotte Perkins Gilman and published in 1899, a woman is sent to rest in a quiet house in the countryside. Her physician instructs her not to leave her room. The bedroom is a former nursery, on top of the house. The walls are decorated with a faded yellow wallpaper with an intricate pattern of yellow flowers. The paper has been worn out by generations of children. 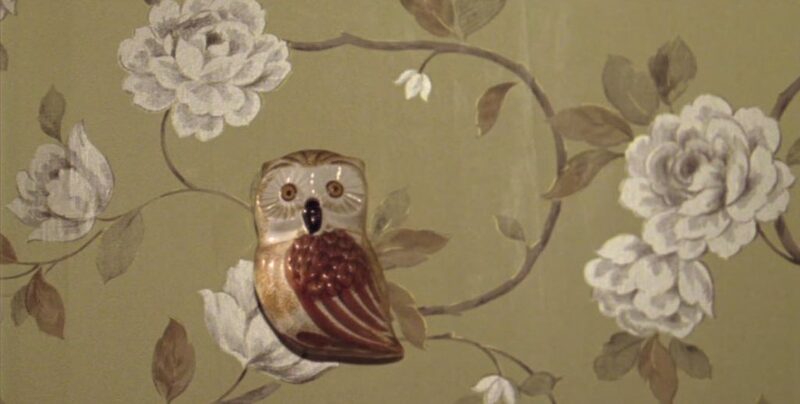 The woman feels discomfort at first, she hates the wallpaper and she is under the impression that someone, or something, is spying on her. She begins to scratch the flowers. At night, she sees a woman beh ind the pattern, shaking the flowers, coming for her. Dans Le papier peint jaune de Charlotte Perkins Gilman, un court roman de 1899, une jeune femme est envoyée se reposer dans une grande villa à la campagne. On l’installe dans une chambre au dernier étage. Les murs de la pièce, une ancienne nursery, sont tendus de papier peint jaune à rinceaux. Personne ne comprend l’horreur que la jeune femme ressent pour cette chambre. Elle a l’impression d’être épiée par le papier peint jaune. Son angoisse monte, jusqu’au moment où le motif floral bouge et l’attaque.